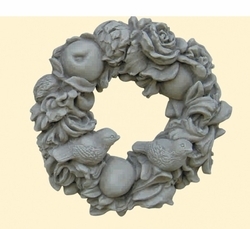 Made in USA by Brookfield Co.
Add 'pop' to your garden walls with our classic Floral and Fruits Wreath with Birds. This beautiful wreath will add a touch of class to any wall. Beautiful high relief detailing, has recessed stainless wire hanger.